David Nahmani is the founder of LogicProHelp.com, the largest online community of Logic users. 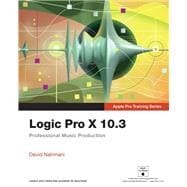 As an expert Logic Pro consultant and teacher, he has worked for Steve Porcaro (Toto, Michael Jackson), Toby Gad (Beyoncé, Alicia Keys), Coco Morier (Britney Spears, Selena Gomez), James Valentine (Maroon 5), Mark Pontius (Foster the People), the Record Plant in Los Angeles, the Winter Music Conference in Miami, the Grammy foundation, ASCAP, Apple, and many more. David wrote and produced songs published by Cleopatra records, Metropolis records, MTV, and Decca/BMG. He coproduced a song on the last Pop Will Eat Itself album and engineered three classical albums for the Bernard Calmel orchestra in Paris, France.